A glimpse inside the hockey bar within the ice rink where the Blackhawks practice. Photograph: Reid Compton Bartender Katie Walsh (right) chats with Salena Becker (left) inside of the Stanley Club at Johnny's IceHouse on Friday. On Madison Street near the United Center, men regularly lug duffels the size of body bags. Their first stop: the rink at Johnny’s IceHouse, home to one of the biggest adult hockey leagues in the country. 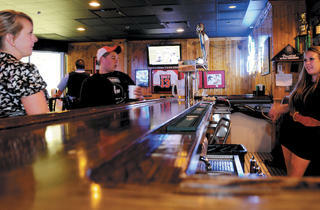 Their second: likely the Stanley Club, the rink’s in-house bar. There are actually two Stanley Clubs along Madison, perhaps the only watering holes in the city where you can see your breath year-round. One is inside Johnny’s IceHouse East (1350 W Madison St, 312-226-5555), the other at Johnny’s IceHouse West (2550 W Madison St, 312-243-4441), where the Blackhawks squad has been practicing for its preseason debut Tuesday 20. While the Blackhawks’ “open practices” at the west rink are free to the public (see chicagoblackhawks.com for the schedule), don’t expect to clink glasses with the likes of Patrick Kane in the bar afterward. Players have a separate entrance (as well as private digs that include a players’ lounge, massage room and sauna). Besides, notes bartender Jen Mahood, to have them quaffing suds at the bar “probably wouldn’t look so good.” Better luck can be had spotting a retired hockey great, thanks to the pickup games for Blackhawks alumni that happen every other Friday. Brian Noonan, Grant Mulvey and Jack O’Callahan, who played on the 1980 U.S. Olympic team, have all been seen tipping back a few inside the bar. 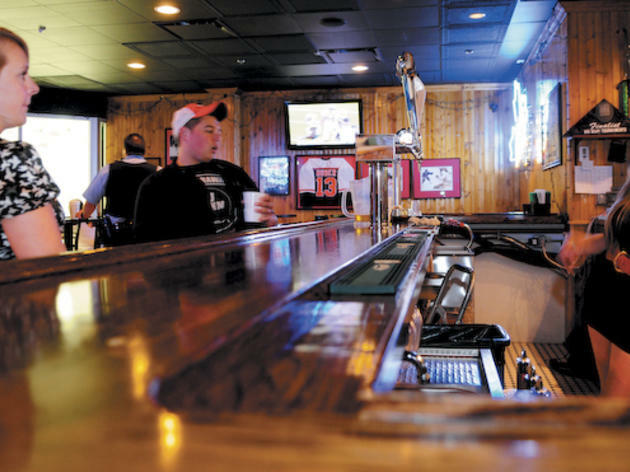 “The conversation in the locker room tends to follow up here,” says Amy Banas, who has tended bar at Stanley Club East since it opened 11 years ago. But the brawling stays on the ice. “I’ve only seen one bar fight the whole time I’ve been here,” Banas says. Above the boards at Johnny’s East, a banner reads, when you lose say little, when you win say less. The 2011–12 Chicago Blackhawks preseason starts Tuesday 20 in Edmonton against the Oilers.